Drawing its inspiration from the perfect Cintrée Curvex curves and reaffirming the startling identity of the Vanguard collection, the Vanguard Lady is emphasized by its glamourous details. The sun-stamped dial is adorned with the colored appliqué relief numbers. 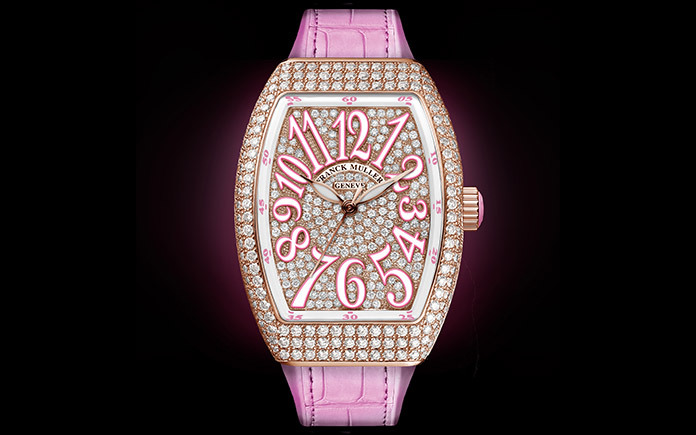 The distinct and feminine numbers perfectly complements the sporty and bold design of the case. While the Vanguard architecture remains true to its original design, the Vanguard Lady is completed by the iconic rubber and alligator strap with feminine colored stitches. The colored winding crown add the finishing touch to this feminine watch. Housing either an automatic or quartz movement, the Vanguard Lady is available in stainless steel, 18 carat rose gold and black PVD and is seen in a wide range of colors. This new collection is at once sporty in terms of its impressive shape and yet very feminine through the elegance of its style.